A rendering of the new Japanese Institute of Sawtelle. The design will utilize the original walls of the structure first built in 1925. Originally printed on Jan 1, 2013. At 87 years old, the Japanese Institute of Sawtelle (JIA) has served for decades as a vital gathering place for Nikkei on the Westside. Last month, JIS announced plans for a much-needed renovation and expansion of the community center. The current building on 2110 Cornith Ave., one block north of Olympic Boulevard, sits on approximately 18,000 square feet of property. The building itself is approximately 8,300 square feet, including four classrooms, a kitchen, bathrooms, and an auditorium. In addition to the Saturday Japanese language school, members of groups such as the Boy Scouts, judo and kendo dojos, local church groups, seniors and others use JIS as a meeting place. The building has seen a lot of history. In the immediate post-war period, for example, the building was used as a hostel for internment camp returnees. Unfortunately, the current building is unable to adequately accommodate the growing number of students. Taught by 13 teachers, students attending the Saturday Japanese language school at the institute range in age from 3 to 18. Because there are only four classrooms to handle the 150-plus students, some classes are being held in the auditorium, and upper-level classes are taught at the Terasaki Foundation Building about half a mile away. 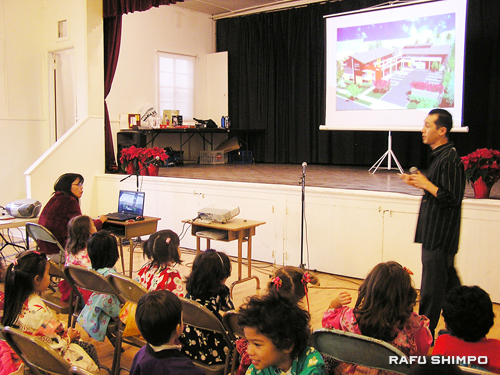 Roughly 300 parents and students who attended the year-end cultural festival held at the JIS were given a first look at the building renovation plans for the facility that are currently awaiting approval by the City of Los Angeles. 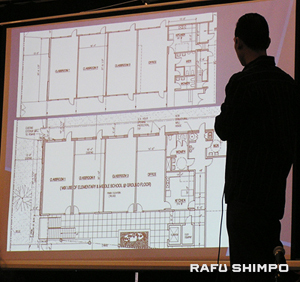 Plans indicate that the current one-story building will be remodeled into a two-story building with nine classrooms instead of the current four, allowing all Japanese language students to attend classes in the same building. Having students in one building will save parents travel time, increase safety and enhance interactions among students and teachers in different grade levels. About 5,000 square feet will be added. There was a renovation plan five years ago that included tearing down the entire structure and digging an underground parking structure, but the cost estimate exceeded $10 million. The current plan saves money by retaining the four walls of the original structure. A request for a conditional use permit (CUP) was submitted this past October and is awaiting approval by the city. Evan Saito, a former Boy Scout who has fond memories of the JIS and is now serving as fundraising chair for the project, explained the opportunities that are being examined to help raise the money for this renovation. The plan targets completion of the construction for the end of 2015 provided enough funds are collected and approvals are received from the city. The group is planning to announce more details of the fundraising plan in February 2013. For more information, write to the Japanese Institute of Sawtelle, 2110 Cornith Ave., Los Angeles, CA 90025, or visit the Sawtelle JIS website (English here, Japanese here).